The Horror Digest: The Mother of Tears: What Happened to Goblins? This Omen Music Crap is a Bust. The Mother of Tears: What Happened to Goblins? This Omen Music Crap is a Bust. The Mother of the Tears is the final installment in the three mother trilogy. Suspiria being the first, Inferno second. I didn't expect this to be as amazing as Suspiria or any of Argento's older films and good thing because this was just....eh. A strange urn is found and brought to the Museum of Ancient art, where Sarah Mandy works. When her and a colleague open the urn they find three effigies, and a strange piece of clothing. Later, the assistant curator is surprised by the presence of a devilish monkey, and then attacked by robed figures who brutally murder her, strangling her with her intestines. 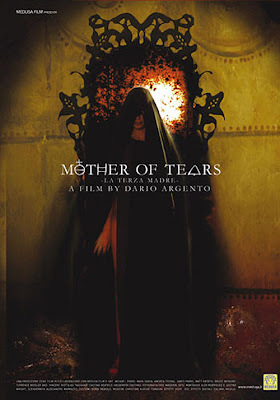 Soon after, gangs and gangs of witches flock to Rome, where the third mother, the mother of tears has been reborn and brought to power. Her powers cause a wave of mass criminal activity and Sarah must discover her inner powers she never knew she had in order to defeat the third and final mother. So I think the main problem with this for me is that the brutality isn't beautiful. I felt like it was just there for shock value. There weren't really any rich colors, and although the deaths were elaborate they just grossed out more than awed. The deaths look too much like all the crap in horror movies that is coming out these days. And at most times it was pretty laughable. For instance when the mother with the baby is taking a nice peaceful stroll across the bridge, she suddenly smiles and picks up the baby and throws it over the bridge. I laughed out loud for it's unexpectedness and it was just pretty funny too. Now lets talk about these gangs of witches. They were so stereotypical and out there. Long black hair with punky colored streaks and menacing finger nails, and cackling. I'm not sure I liked how they were so present. In Suspiria and Inferno, the "witches" were more of an underground thing. Maybe it was just the Mother of Tear's overall affect and power, but it just felt so...obvious. The part with Sarah's mother as a ghost helping her out was kind of cheesy. And there were too many boobies. Also, why did the Mother of Tears have to be so beautiful when the others were basically just hags. I guess I was just disappointed that it turned into one of those bad horror movies. Oh well I still love you Dario Argento. 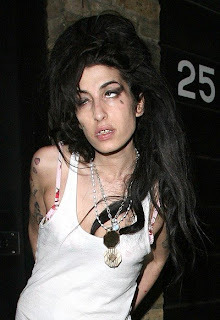 Oh and the Mother of Tears looked kind of like Amy Winehouse.